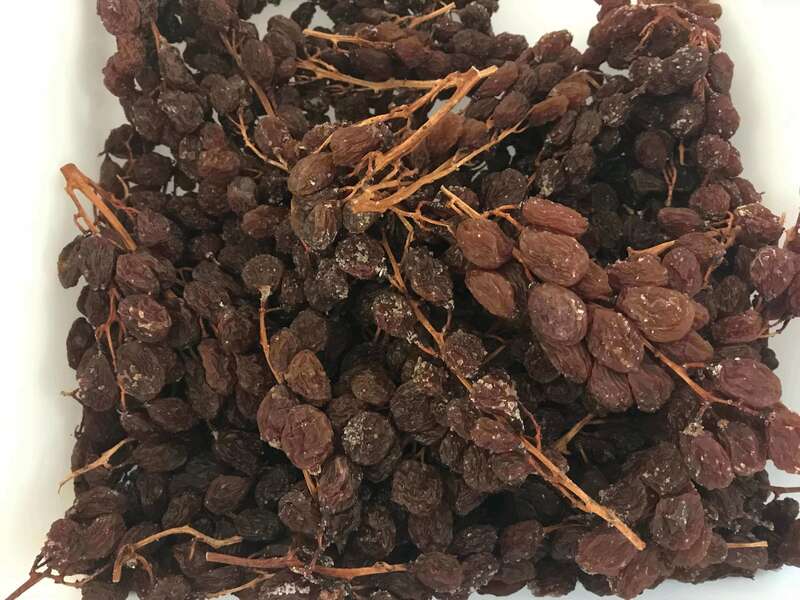 Raisin Clusters MuscatRaisin Clusters Muscat These lovely Australian grown ‘Muscat of Alexandria’ variety of Raisins are naturally dried on the vine. 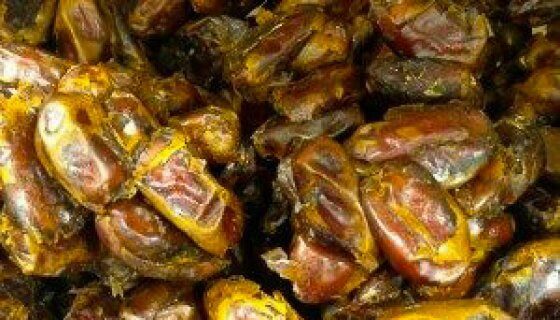 They are full of sweet, fruity taste and aroma, with a deep burgundy colour. These raisins contain small, edible seeds that add unique flavour and a little crunch. Grown without any synthetic pesticides, these delectable raisins are GMO free with no added oil, sugar or preservatives, and are non GMO. Flavour filled Australian Raisin Clusters are great to have in the pantry, ready for a quick snack. They also look fabulous on a cheese & fruit platter, perfect for entertaining. How to Use:Enjoy these clusters of yummy Australian Muscat Raisins as a quick and convenient, natural snack. Or pop some in a picnic basket or as a delightfully yummy surprise in lunch boxes. Combine them with other dried fruits, seeds and nuts in a moreish trail mix.For savoury recipes these intensely flavoured raisins can be picked from the stem. Add to pickles, chutney and stuffing. Toss a handful into a curry or stir-fry. They also go well with rice, cous cous or quinoa – serve as a salad or a side dish.Use raisins to add natural sweetness to home-baked bread, fruit buns, muffins, biscuits, cakes or puddings. They can be pre-soak in a little warm water or juice – to prevent them from absorbing moisture from your dough or cake mix.These Raisin Clusters on the vine are perfect for entertaining - they look great on a fruit platter and the wonderful flavour is lovely with cheese or a glass of wine.Ingredients: Australian Muscat of Alexandria Raisin Clusters.GMO Free, No Added Sugar. Paleo.Allergens:No Known Allergens. This product may contain traces of Allergens.Storage:Store in an air tight container in a cool, dry place, away from direct sunlight. Refrigeration recommended in warm climates.Shelf Life:Up to 12 months when stored as above. See Best Before date.SKU: 21902. 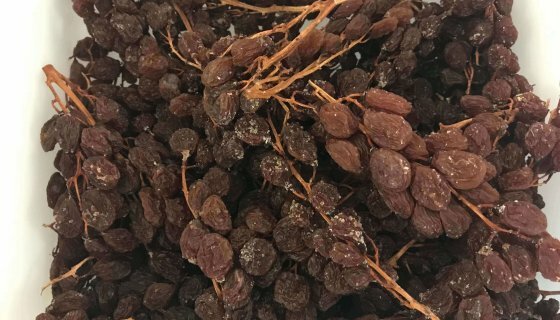 These lovely Australian grown ‘Muscat of Alexandria’ variety of Raisins are naturally dried on the vine. They are full of sweet, fruity taste and aroma, with a deep burgundy colour. These raisins contain small, edible seeds that add unique flavour and a little crunch. Grown without any synthetic pesticides, these delectable raisins are GMO free with no added oil, sugar or preservatives, and are non GMO. Flavour filled Australian Raisin Clusters are great to have in the pantry, ready for a quick snack. They also look fabulous on a cheese & fruit platter, perfect for entertaining. 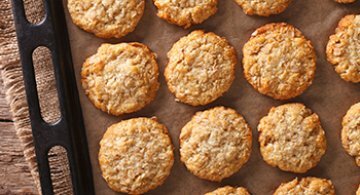 Enjoy these clusters of yummy Australian Muscat Raisins as a quick and convenient, natural snack. Or pop some in a picnic basket or as a delightfully yummy surprise in lunch boxes. 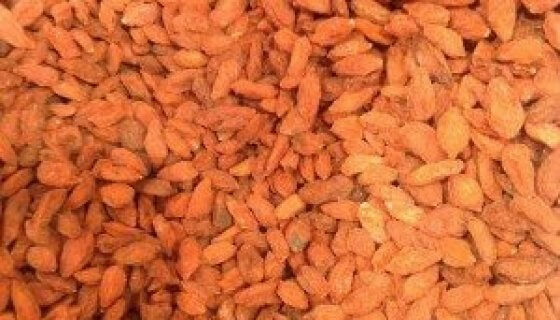 Combine them with other dried fruits, seeds and nuts in a moreish trail mix. 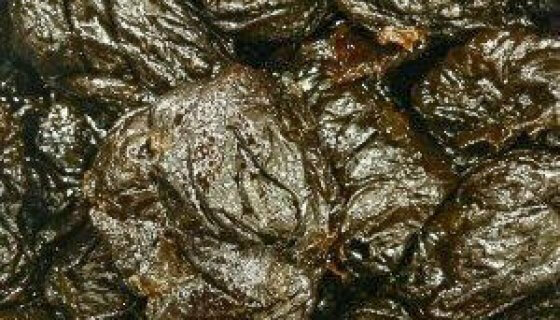 For savoury recipes these intensely flavoured raisins can be picked from the stem. Add to pickles, chutney and stuffing. Toss a handful into a curry or stir-fry. 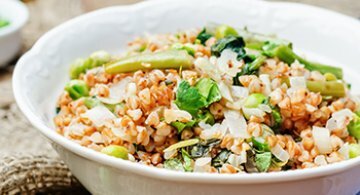 They also go well with rice, cous cous or quinoa – serve as a salad or a side dish. Use raisins to add natural sweetness to home-baked bread, fruit buns, muffins, biscuits, cakes or puddings. 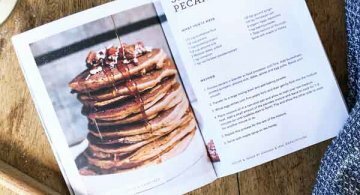 They can be pre-soak in a little warm water or juice – to prevent them from absorbing moisture from your dough or cake mix. These Raisin Clusters on the vine are perfect for entertaining – they look great on a fruit platter and the wonderful flavour is lovely with cheese or a glass of wine. Australian Muscat of Alexandria Raisin Clusters. GMO Free, No Added Sugar. Paleo.